HDP operation: which MPs have been arrested? It has been 24 hours since a coordinated nationwide police operation was launched against lawmakers from Turkey’s pro-Kurdish Peoples’ Democracy Party (HDP), the third-largest group in parliament. The picture is hugely confusing, with conflicting reports of arrests, warrants and court-issued charges. Some MPs – including the party’s co-leaders, Selahattin Demirtaş and Figen Yüksekdağ – are tonight behind bars pending trial. Two MPs – Tuğba Hezer and Faysal Sarıyıldız – were abroad at the time of last night’s operation. Pro-government sources claim they have cancelled plans to return to Turkey. Here’s a spreadsheet – updated as frequently as I can – of the 59 HDP MPs and their present status. 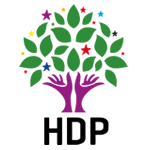 Update 13 December 2016: warrants have been issued for the release of more HDP MPs, meaning this page is being updated once again. Update 26 April 2017: this spreadsheet is still being updated as more MPs are detained, arrested and released.